A short 40-minute drive south of Portland, the agricultural bounty available in Yamhill County, Oregon, is unparalleled. Rich, fertile soils coupled with warm days and cool nights create the perfect breeding ground for luscious berries, hazelnuts, vegetables, herbs, cheese, livestock, hops and, of course, the world-class wine for which Oregon’s Willamette Valley in most known, to thrive. Small communities dotted around the county thrive with local farm-to-fork restaurants, farmer’s markets and farm stands, and plenty of tasting rooms. Residents and visitors can connect back to the land by picking berries, riding horses through vineyards, tasting local honey, and learning the art of cheesemaking from artisan producers who passionately describe their farming philosophies. We invite you to come and taste the fruits of our land at Bounty of Yamhill County. Celebrating its sixth year, August 24 – 26, the event is a three-day weekend fête showcases the exceptional wineries, farms, and chefs in Yamhill County through a variety of culinary activities. 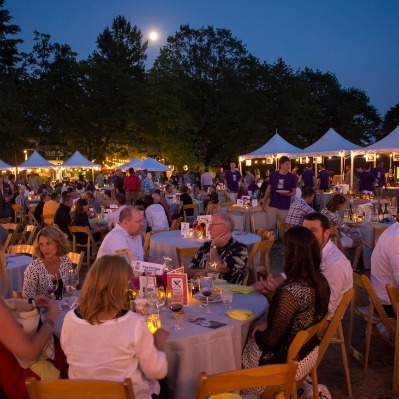 From alfresco dinners to sparkling wine tastings and floral seminars, Bounty of Yamhill County incorporates innovative vintners, agricultural trailblazers, and some of the best chefs in the country. The weekend culminates in the Big Night Dinner, featuring 20 chefs paired with 20 farmers in a walk-around feast. Sip wines from 25 of Yamhill County’s most prestigious producers as you mix and mingle with winemakers and chefs alike. Voted one of the Top 10 Best Food Festivals by USA Today 10Best and The Culture Trip, no other locally sourced food and wine event is as much fun while also doing well. Proceeds from BOYC benefit the Yamhill Enrichment Society, a local cultural nonprofit that supports programs in the arts, music, education, food, and agriculture.